Hails from Cape Town, South Africa, and lived in District Six as a child where he experienced the heart and soul of South African Cape Culture. He was inspired by Flamenco guitar music at an early age and was determined to find a way to learn the music he loved. This concert will be a journey infused with some of the magical and brilliant mind of the late Maestro “Paco De Lucia” spanning over 40 years. 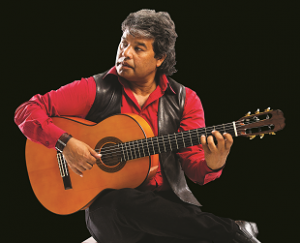 It will consist of a few classical flamenco pieces well loved and connected to guitarist around the world. We can never do justice to what this great man have brought about over the years in the world of flamenco , but we can keep it alive as his spirit will forever dwell in my compositions. Another great influence in my life was “The Gipsy Kings” whom I also personally met, I will be playing some of their beautiful melodies just to connect the audience of the time they dominated the world with their Latin pop fiery rhythms. I will also be playing some traditional and cante jondo (Deep Hearted) rhythms of myself and Paco De Lucia where the audience will recognize where the similarities of our work are at. I have had pleasure of meeting Maestro Paco De Lucia in London in 1999. In 2014 I was invited to do Master Classes with one of the greatest flamenco players in the world namely, Rafael Riqueni in Seville and was lucky to stay and travell with him for a month and a half and learning so many things about the flamenco guitar at the time with him.